Aluminum Plant Label Tree Tags Pot Label Tag Outdoor Marker Metal 100 Labels by Amekron at Tulips Orchids. MPN: 4336468969. Hurry! Limited time offer. Offer valid only while supplies last. This labels are soft finish very easy to write on it. We have a lot of rare cactus if you want something rare let me know and I will listing for you. This labels are soft finish very easy to write on it. We have a lot of rare cactus if you want something rare let me know and I will listing for you. Questions? feel free to email me. Because they are unaffected by moisture and most chemicals, IMPRESS-O-TAGS and their noncorroding wire ties are ideal for pricing and identifying nursery inventories. 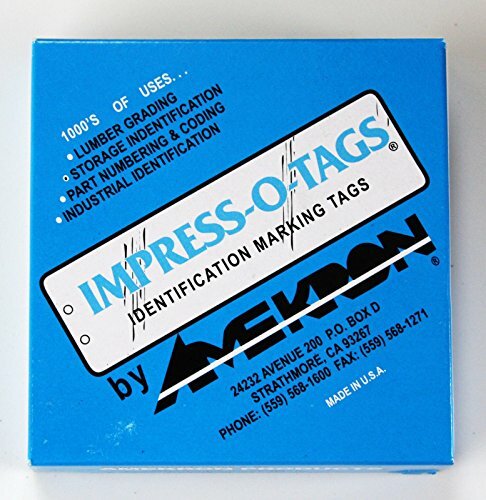 Our IMPRESS-O-TAGS are ideal for marking equipment, processing systems, and samples in many kinds of experimental work. IMPRESS-O-TAGS provide a convenient, inexpensive way to mark utility poles, sign posts, meters, valves, lines, junction boxes, and other equipment and fixtures. The tags can be wired, stapled, nailed, taped, or glued to the objects they mark. Aviation, automotive, and other repair establishments, IMPRESS-O-TAGS retain identification and information on parts and assemblies throughout the repair cycle. Rugged, noncorroding IMPRESS-O-TAGS can mark equipment in harsh environments. SAFE - IMPRESS-O-TAGS cannot be magnetized-they are safe for use in sensitive electronic applications. DURABLE - The durable, noncorroding finish does not oxidize, even with prolonged exposure to weather, most chemicals, heat, and dirt. This means your message is permanent and remains legible for years in any environment. MULTIPLE USES- Light-weight IMPRESS-O-TAGS can be wired, stapled, nailed, taped, or glued to many objects STRONG - Sealed sides add structural strength to the IMPRESS-O-TAGS, they resist bending and damage. AFFORDABLE - Noncorroding aluminum wire ties are included with each order of IMPRESS-O-TAGS at no additional charge. Size: 1" x 3 3/8" (inches) #Applications can include: •Plumbing supplies •Electrical wiring •Aircraft industry •Grid stations •Mining •Shipping and Receiving •Chemical companies •Marking core samples •Identifying specimens •Building projects •Inventory identification •Storage facilities And many more. Thousands of companies across the U.S. use IMPRESS-O-TAGS in their plants, offices, warehouses, and in the field because they are durable, easy to use, and inexpensive. If you have any questions about this product by Amekron, contact us by completing and submitting the form below. If you are looking for a specif part number, please include it with your message.